I'm slightly granny. I admit it. A lot of the things I enjoy are things that I picture most grandmas enjoying; cross stitch, crochet, knitting, a quiet Friday night at home. I love Pride and Prejudice and Sense and Sensibility, or as my husband refers to them (in nasally, hoity-toity British accent, drawing out the first syllable), the *"Hodamule" books/movies. The first time I watched "Sense and Sensibility", I was seriously depressed that I wasn't born in the 1800's. My love of indoor plumbing quickly remedied that depression, however. I sometimes even talk like and old person; those of you who know me I'm sure have heard Seth make fun of me for a time I told him a friend and I "chit chatted about such and such". I do think that despite my gravity towards all things old lady, I have a cool streak. I've played every Zelda (with the exception of Majora's Mask, which, let's be honest, completely sucked), Left 4 Dead, and almost all of the Mario games. I've read Watchmen, and even watched a few of the old school Bond movies (yeah, Goldfinger!). Okay, so I guess I'm playing fast and loose with the term "cool", but I think you catch my drift. About a week ago while browsing Ravelry (for any other grannies out there, you MUST check it out), I found something that joins my granny side with my nerdy 15-year-old boy side. 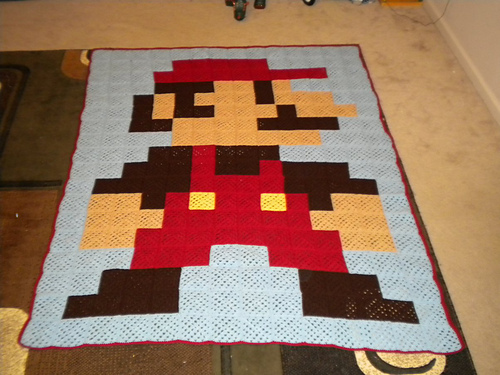 A MARIO afghan??? How sweet is this???? It will be mine. Oh yes, it will be mine. Newer Post>Lucas : EATING SOLIDS! !